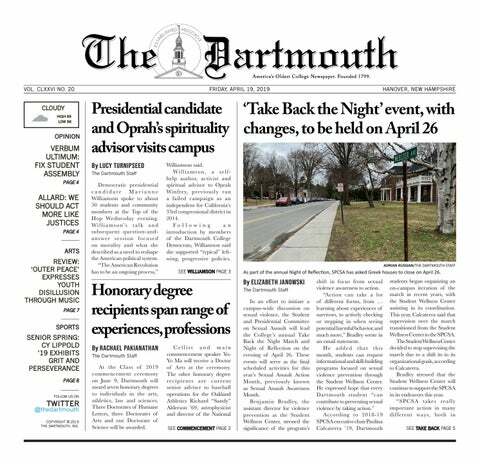 After the candidates presented their qualifications, moderator and editor-in-chief of The Dartmouth Debora Hyemin Han ’20 asked a question about the Board of Trustees that revealed a major divergence in opinion between the three candidates. Every candidate acknowledged that the Board of Trustees possessed the “keys of power” ­— to use Holman’s phrase — in terms of tuition, leadership and policy. Cuomo maintained that pressuring the administration to include a student on the Board of Trustees would be a fruitless endeavor. He pointed out that the Board of Trustees has a tendency to choose appointed members over elected ones, suggesting that the body was fairly conservative and impenetrable. To fortify their argument, Kovary pointed out that her and Cuomo preferred a “baby steps” approach toward an open line of communication between the Student Assembly and Board of Trustees. Holman vehemently disagreed and began to shake his head during Cuomo’s answer. Holman asserted that other colleges, such as Cornell University, have a student on their Board of Trustees and that Dartmouth should follow suit. He claimed that besides an ’05, the youngest person on the Board of Trustees is a ’92. He criticized this “generational divide,” saying that it would prevent the Board from effectively assessing student needs. The website of the Board of Trustees does not list a member of the Class of ’92 and lists as members Erica Shultz ’95 and Nathaniel Fick ’99. Johnson also said that she preferred a more “aggressive” approach, suggesting that the Student Assembly should “up the ante” in pushing for a student representative on the Board. Beyond this initial point of contention, the candidates proved to have many similar stances over the course of the debate. On the issue of mental health, all four candidates agreed that there is dearth of psychiatrists and counselors on campus, which poses a serious problem for students facing mental health issues. The candidates all expressed approval of reforming the school’s “reactive” sexual misconduct policy and expediting the Campus Climate and Culture Initiative, which would unify sexual misconduct policy for students, faculty and staff. Johnson’s distinguishing policy lied in her commitment to making inclusive spaces on campus for people of color. She said that the College should make a greater effort to hire faculty members of color and that she would like to reform the process of reporting bias to make it more accessible. Lola Laguda ’22 attended the debate without knowing about the candidates’ background or policies beforehand. She says that the debate tuned her onto issues that she didn’t necessarily know were there to begin with. Laguda said she was struck by Holman’s “personable” character, especially the tactic he used in which he referred to crowd members by their first name. “Personally, I could tell that Tim Holman seemed to have a lot of fans in the audience and I think that may have impacted how I saw the debate because there was a huge applause every time he said something,” Laguda said. Rohan Chakravarty ’21 served as Cuomo and Kovary’s campaign manager, and said he left the debate feeling positively about the discourse that took place and his ticket’s performance. Current president Monik Walters ’19 and vice president Nicole Knape ’19 were also present at the debate, and were frequently mentioned by the candidates. Walters said that she believes each candidate has the capability to become president. She said that although Johnson did not have the same Student Assembly experience as her competitors, she was still a qualified individual to run.